Even though I’m not a fan of Resolutions…I do understand how the New Year brings about a renewed feeling, a new lease on life, and affords some people the opportunity (through time off work, around the holidays) to work on the house! I wanted to share what we did for New Year 2015, to help with ideas for people looking to organize and pare down their lives in 2016. 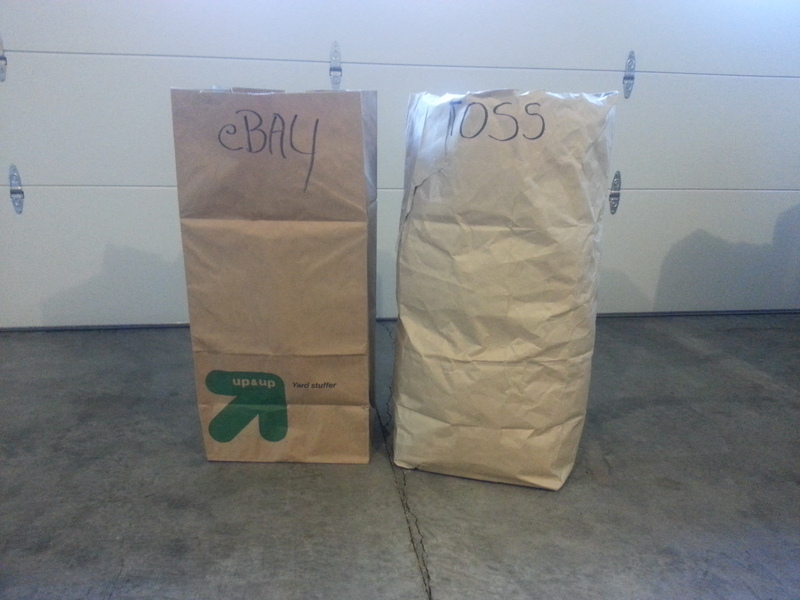 I set ourselves up for the New Year, by purchasing 15 Lawn & Garden Bags from Amazon.com. These are tall, big bags! And…it was my goal to fill Every. Single. One. Of. Them!! GIVE = Anything we no longer needed, but is in good condition & can be re-loved! 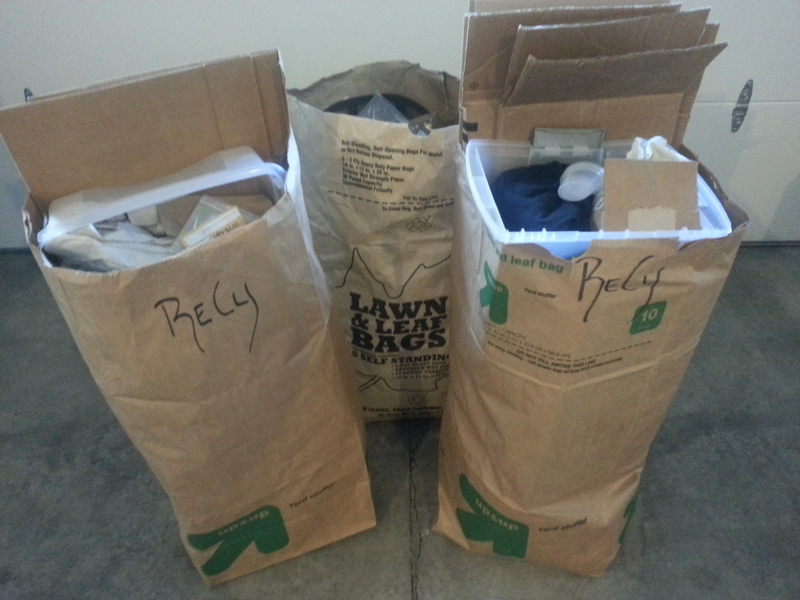 ReCy = Recycle…because boxes will be emptied, papers will be old, etc. Recycle it! eBay = Because, YEAH, it’ll be fun to get some funds from all this work, right?! TOSS = Trash! There’s gonna be trash! Items that are, literally, rubbish -or- items that just simply should not be given away, because they’re broken, holey, stained, etc. Just have a TOSS bag ready and dump that trash! It’ll feel SO good! I did not have a set count for each type of bag. I just simply knew that we needed to go through the house, room by room, and fill bags. At the end of it all, we had to have 15 of these monsters filled and out of the house! Once a bag was filled, we’d start a new bag in it’s place. How did we decide what needed to go? We’ve moved so many times in a decade…SO freaking many times (including an overseas move!) Some of our boxes had, literally, not been opened in 5+yrs…eek! 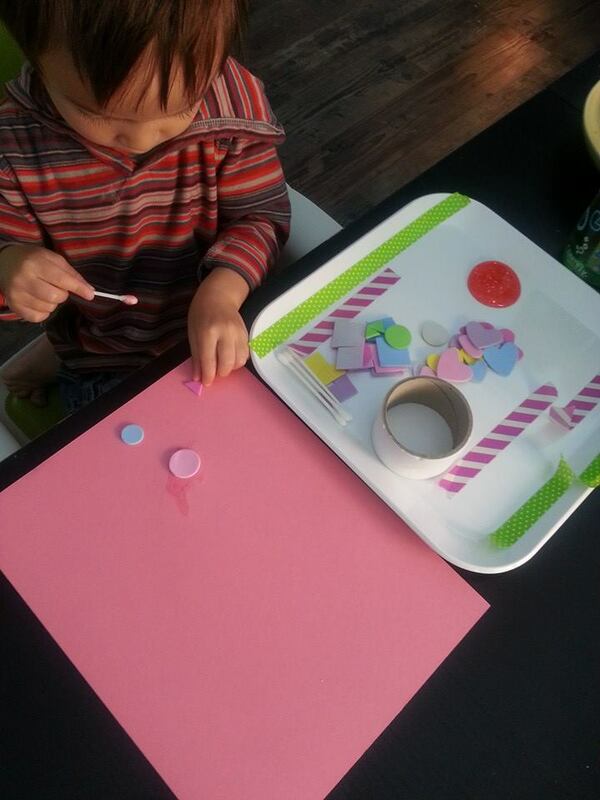 Now that we have a toddler, our priorities and need for things has changed…drastically. ~ Thus, opening those 5yr old boxes, going through the contents, and remarking, “Whoa, I didn’t even know we still had this! !”, was a pretty good indication that we didn’t need “this” anymore…in a bag it went! ~ I’m big on feelings/emotions of things and how they make me feel. So, yes, I used the age-old purging technique of ‘how does this make me feel?’. It works! There were, indeed, items that kind of gave me a low/sad feeling…why keep it!? In a bag it went! I, also, had items that put a sweet smile on my face, but regardless, was not an item I needed to keep any longer…I wanted it to put a smile on someone else’s face vs. being pack-ratted away. So, in a bag it went! ~ AND…Sometimes, you just have no emotion at all…ya just pull something out and think, “Get rid of it! Why the crap do we still have this?” and in a bag it went! 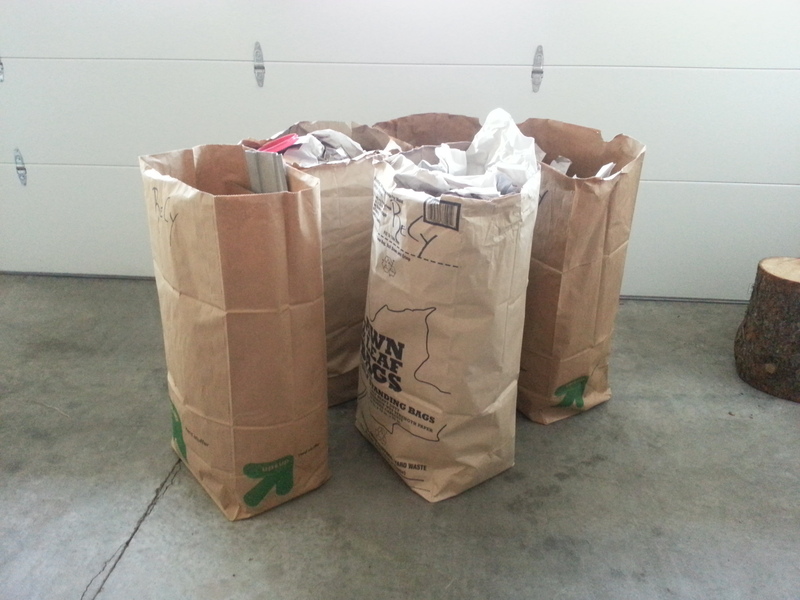 ~ Realistically, we did keep a “holding” pile…a pile of things that we couldn’t figure out. We’d go back to it every few weeks and rummage through…typically, we’d remove half of the pile and put it in a bag. Basically, it’s kinda in a pile for a reason, eh?! In a bag it went! All of THIS, above, was not an easy, quick, and sometimes, not fun, task. 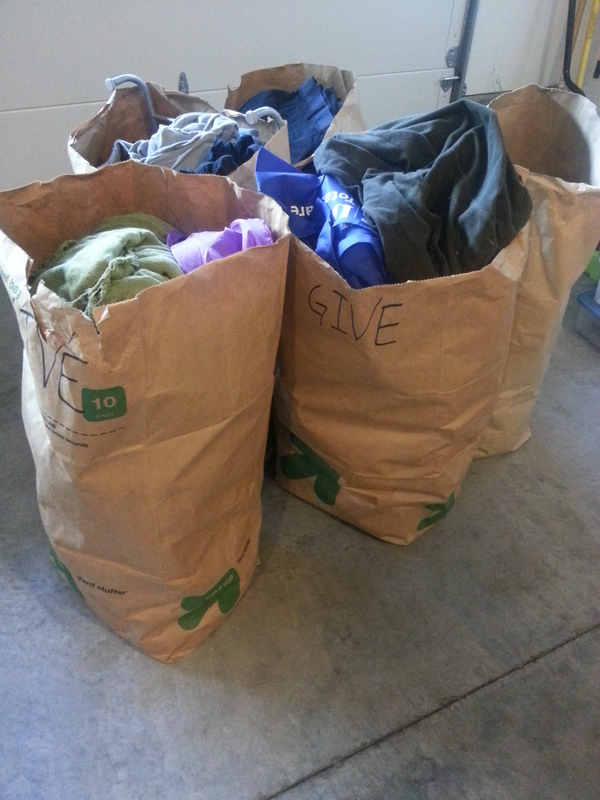 But we persevered, we completely filled all 15 bags by August 2015! Side Note : The Teen Challenge Thrift Shop came out and picked up all our items (bags and other oversided items) for a $10 donation…Totally worth it! How many of each bag did we have? 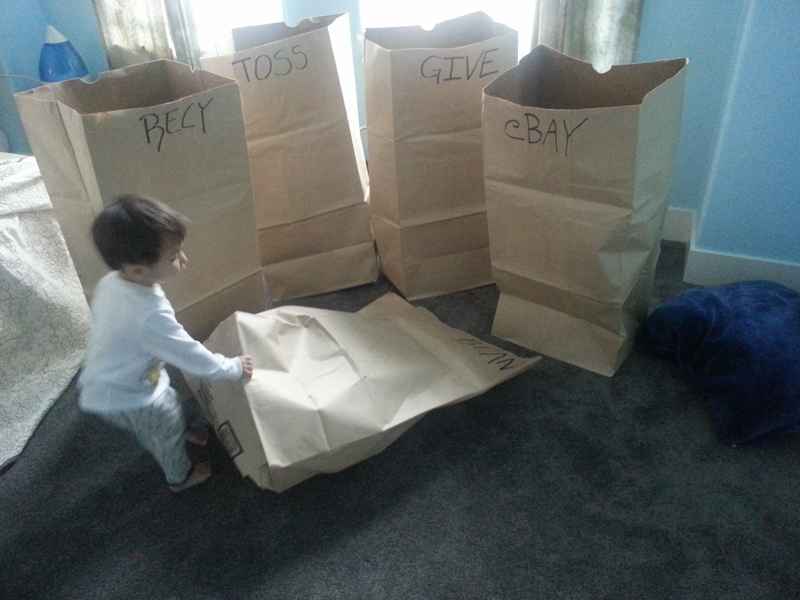 All told, the number of each bag we ended up with was kind of surprising! More ReCy bags than any and only one TOSS bag! Not wanting to get back into our ‘old’ ways…we followed up our purging with a big organizing binge! 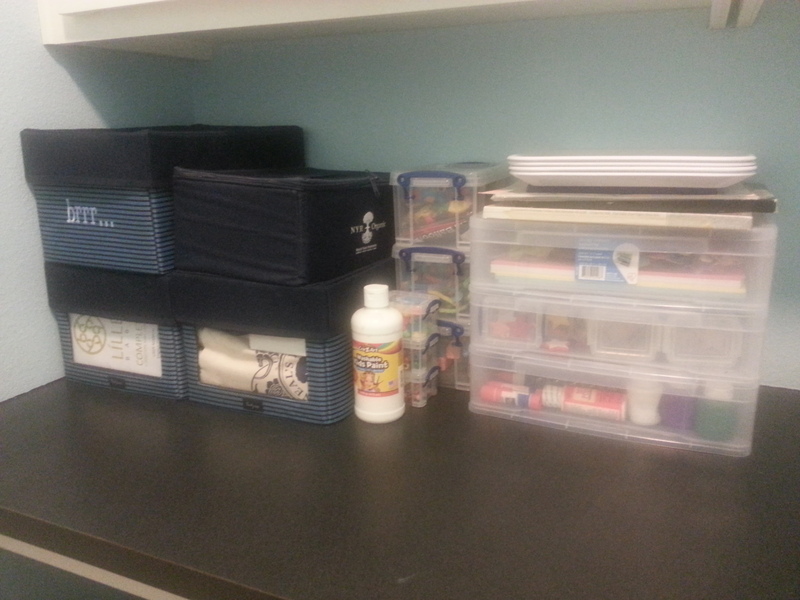 I went a little bonkers on the organizing front…but I LOVE the way it looks and feels! 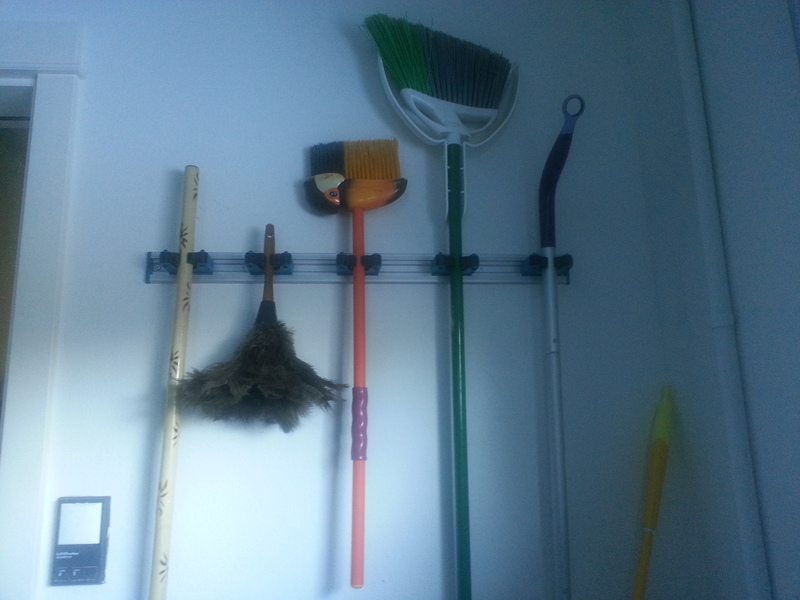 ~ We got those awesome brooms, shovels, mops, etc. hanging holders from Loew’s for the garage. 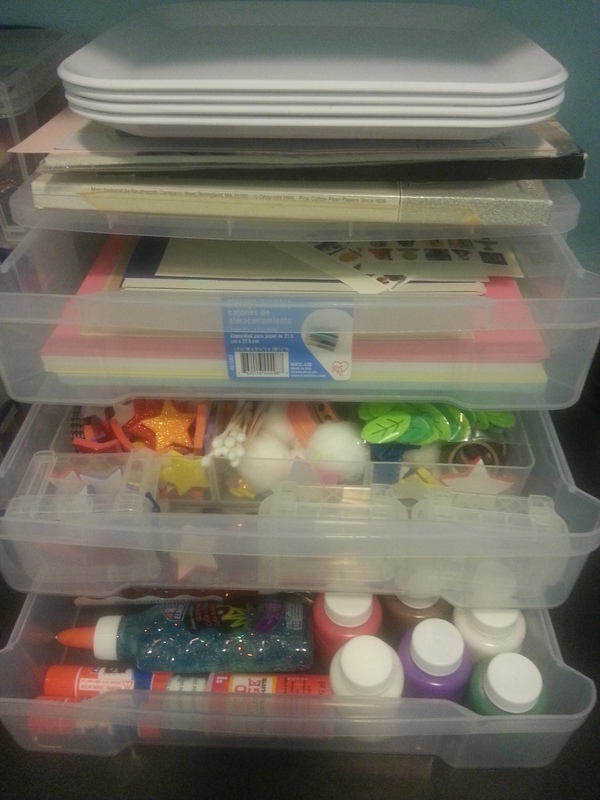 and in the laundry room to hold my tot’s art/craft supplies for our fun ‘invitation to play’ art trays! ~ At the time, I ordered through a friend who is a ThirtyOne Bags consultant! First time I saw these, I wasn’t sure if they’d make a big enough difference in our home. Then I started looking at the site and considering options, including personalized embroidery. Sooooo…I just decided to host my own party with my consultant friend! This way I got all the goodies I wanted and tapped into the hostess specials. 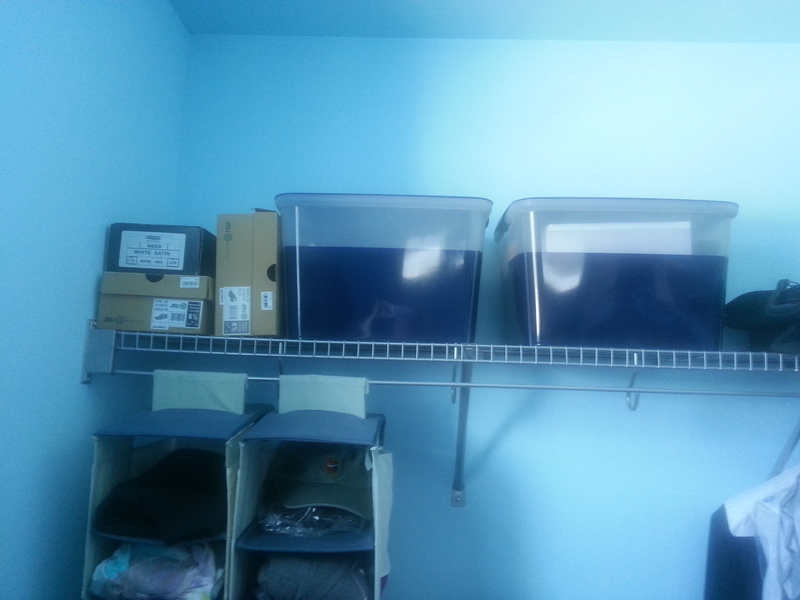 I purchased during the big ‘stand tall insert’ month, so that I would get the organizational insert for the Large Utility Totes. How did I use my ThirtyOne Bags to organize? In the Laundry Room, sitting on the folding counter and organizing our winter accessories (brrr…. ), swim needs, and small items needed for my mama’s group events. These are the awesome Your Way Rectangles with Personalization! In the linen closet, to hold a full bed dress-up. Each Large Utility Tote has a full sheet set and blanket…making it easy for my hubs, or guests to grab and go…thus, makes it easy for me! 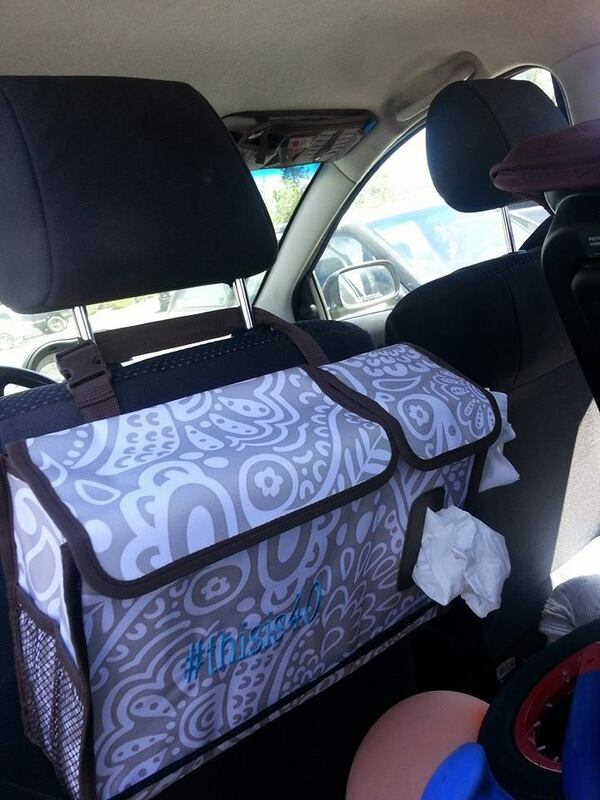 I, also, used our new Thirty-One Bags in the car and linen closet. 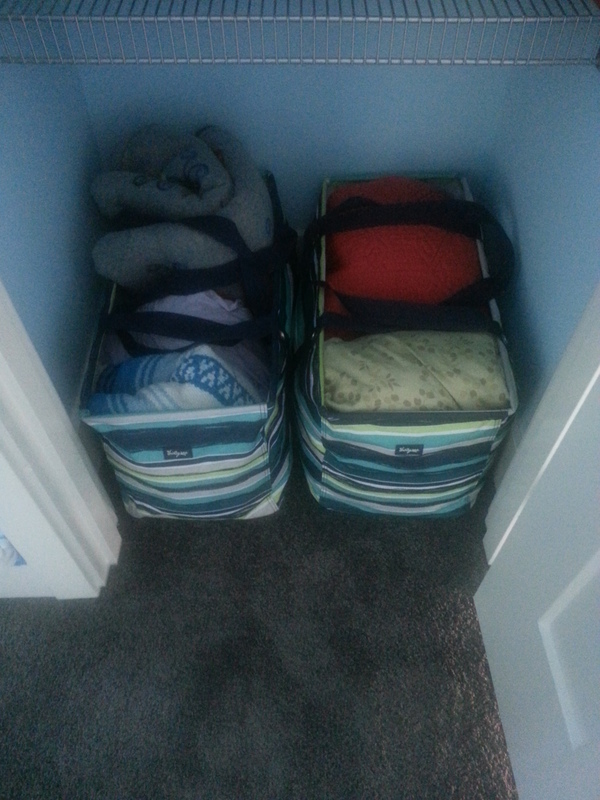 Above, Large Utility Totes hold Blankets -and- a whole Guest Bedroom Set, ready to pull out and use…then dump everything back in there when taking it to laundry room. Below, a Hostess Exclusive, at that time, came with a cube for the trunk, too! We did A Lot of work in 2015, I still have some stuff I’d like to “pretty up” and organize and that will come in time! Where are you gonna go from here? Pick up your 16 bags and fill ’em up!